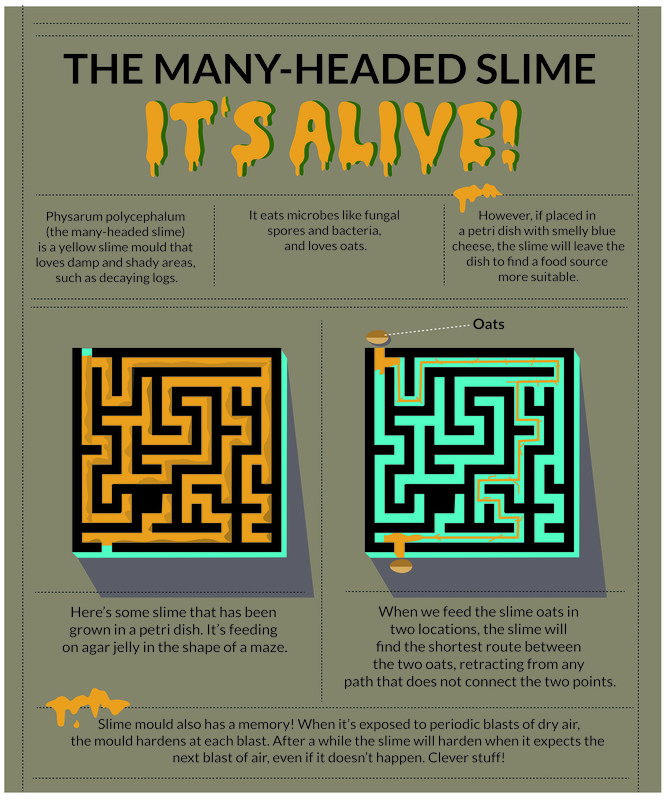 Meet physarum polycephalum, the many-headed-slime! Meet physarum polycephalum, the many-headed-slime. It might not look like much but this brainless mass of yellow scum is a single gigantic cell. Despite having no brain, not even a nerve cell to its name, this curious organism explores its environment, solves mazes and works out road networks all for the simple reward of a bit of porridge! Physarum polycephalum (the many-headed slime) is a yellow slime mould that loves damp and shady areas, such as decaying logs, you may have seen it whilst out walking in woods or forests. The organism searches for food, surrounds it and secretes enzymes to digest it. It eats microbes like fungal spores and bacteria, and loves oats. If placed in a petri dish with smelly blue cheese, the slime will leave the dish to find a food source more suitable. In Warwick's School of Life Sciences, lives Mazie, a slime mould that has been grown in petri dish. It feeds on agar jelly in the shape of a maze. When Mazie is fed oats in two locations in the maze, it will find the shortest route between the two oats, retracting from any path that does not connect the two points. In mazes that have more than one solution, Mazie can still find the shortest route. The key to Mazie's success is its memory - which is external. Wherever it goes, a slime mold lays down a chemical trail. When it's exploring something like a maze this trail tells the organism where it's been before and which areas aren't worth looking at again. It's a very similar technique to foraging ants leaving trails of pheromones for other workers to follow. Slime mould can also be trained to use this memory. When it’s exposed to periodic blasts of dry air, the mould hardens at each blast. After a while, the slime will harden when it expects the next blast of air, even if it doesn't happen. Clever Mazie! Mazie is brought to you by the School of Life Sciences Outreach Team. You can find out more about the many-headed-slime mould, including how to keep your own Mazie, by following this link.